Paul Jay:	Welcome back to Reality Asserts Itself. I’m Paul Jay on The Real News Network. We’re continuing our discussion with Gabriel Byrne, and you should watch the earlier episodes and not only will this next episode make more sense, but you’re also going to hear the whole introduction, because you’re not going to hear it now. Thanks for joining us again, Gabriel. Paul Jay:	We left off in the last segment about you starting to think critically, which means you start thinking about all the assumptions you grew up with your whole life, which includes Catholicism. It includes God, it includes Irish nationalism, and even, you know, in terms of the way the media presents politics, you start questioning all of that. It’s rejecting a large part of your own identity because as we learned earlier, again, watch the earlier episodes and you’ll know what I’m talking about … National identity, the national narrative, mythology about Irish nationalism, Catholicism, it was so much about who you were. You start to unpack yourself, it’s kind of interesting. Gabriel did a show for HBO, a series called ‘In Treatment,’ where he’s the psychiatrist, therapist? Paul Jay:	Therapist, and you know, part of the therapy is unpacking your psyche. You’re doing it during this period. I also started to look back on the kind of life, especially in relation to my father and other people that I know. Then I began to see that poverty, not having enough, was another form of control. If you were getting from week to week, just about, you don’t have time to think about very much, and all about me were people who went to Mass every Sunday and had their football and their pub and so forth, and I didn’t want that life for myself. I wanted to try to expand myself to see how far I could go, I suppose. Then I met those guys the next day, and they were 23 and 24 year old kids with hangovers, who had just come back from six months of intense stress, and I knew they were just kids. They were just kids. Paul Jay:	How old were you at this point? 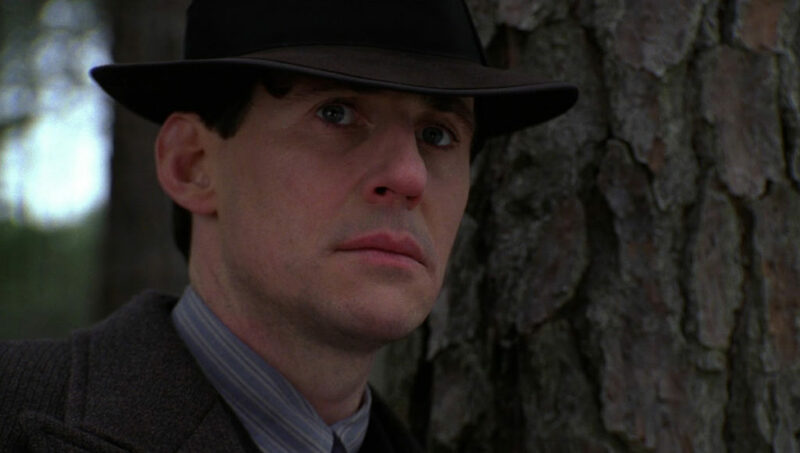 Gabriel Byrne:	I was about, maybe 28, 29, 30, something like that, and I just let it go, because I thought, you know, the way the British army recruits people, is they go out to places where, you know, they’re going to find people who don’t have jobs and futures and they co-opt them into the army with the prospect of seeing the world and so forth. I don’t know what it was about these kids, hung over, and just looking abjectly sorry, I just thought, they just got back that day and they heard another Irish accent. Being Irish was also reflected in the kind of fiction that I saw on television. It was reflected in the comedy. There was a whole plethora of anti-Irish jokes. I never knew an anti-English joke growing up, but I knew tons of anti-Irish jokes. Then this notion started to creep in, I remember the very first movie I was on, you know, camera right and camera left, they’re opposite? I moved in the wrong direction, and the cameraman said to me, “No, no, no, Gabriel, not the Irish right,” and I thought, okay, now Irish is equated with stupidity. It’s equated with drunkenness, it’s equated with terrorism. It’s also equated with being folksy and charming and all that stuff. So that became an identity that you had to search through and say, what worked for me over there doesn’t work for me here, and I’m being viewed from a very fractured perspective. I think also, today living in America. I think about people who come from other countries, whether they’re refugees or people who left under benign circumstances, and I think about the work that they have to do to reassemble an identity, because when you move from one culture to another, 90% of your culture has to be shut down, because your culture is local to a great extent. Your sense of humor, the people that you know, the books that you read, the television stations, you have to subsume yourself to the larger culture. In a way, the kind of, the journey of the immigrant, or the exile, is in many ways a lonely one because you don’t have your community and the strength of your tradition to hold you up. Gabriel Byrne:	For sure. I looked at all these programs and newspapers and I said, “Where are we? What’s our perspective?” There’s a huge conflict going on in the north of Ireland, and I was reading about it from a British perspective. Then I would look at the American papers and I would see that most of the time, the British perspective was the one repeated in the American papers. I thought to myself, I have no voice, I have no power. I have no perspective here. I don’t figure in this narrative, and it made me think about, you know, what it means to be culturally transplanted. Paul Jay:	You get, around this time or not too much longer after this, you get cast in Miller’s Crossing? Paul Jay:	Well, all of a sudden, you’re in, if you want to be. You can be a brand, an icon. You’re now a star. You made it in Hollywood, you’ve got a big movie. Paul Jay:	You don’t have to be the outsider anymore, you can be one of the in crowd, and you kind of choose not to be. Gabriel Byrne:	Yeah, it’s an interesting question. I mean, I think that Hollywood … I don’t know Hollywood is a place as much as it is a kind of a state of … I always think of it like a factory, and I never really liked working at the factory. I always felt an outsider there. Maybe I just feel like an outsider everywhere, but I think as an immigrant, you’re an outsider, but when you go into that business, you’re called into it, but I never felt comfortable being in that group of people because it felt very exclusive to me, and I didn’t want to be in a kind of exclusive … plus I had all these experiences that made me question the system there, too. I remember saying to somebody one day, “If you can have a national kind of fairy tale or myth that stands in for where you are at the moment, it’s Rip Van Winkle. You fall asleep under a tree, you wake up and things are completely different.” That’s a very pertinent and powerful myth. That’s what I felt. I felt completely out of touch there. Paul Jay:	But Hollywood, when you got a hit, and people want you, which is a rarefied place to be, because of the thousands and thousands of actors, what is it, one or two percent even make a living out of being an actor, never mind have a hit that breaks through. Paul Jay:	It’s awfully seductive. Paul Jay:	It’s aphrodisiac plus, not to buy into that is, it’s kind of a big thing. There’s not very many people that don’t want, once you’ve got it, don’t want more of it. I don’t mean more films and acting, but the cultural veneration that goes with it. Gabriel Byrne:	Yeah, yeah. You see, the thing about it is, that I suppose having had the journey that I had, I wasn’t somebody who said, “I’m going to go to Hollywood and be a star.” It all happened absolutely by accident. I had no game plan, I had no publicist, I just said, okay, this sounds like a really great movie to do, and then suddenly I was this guy in a hugely, critically acclaimed film in Hollywood. I’ve often thought that fame, it’s not that really you change in yourself, what happens is, people around you change, and that starts to really change you, then, because you begin to think, all these people are reacting to me in this way. Maybe I was wrong about the way I felt about myself. Maybe all these people are right about this. With that kind of celebrity comes power, and it’s a power that I never sought, but I knew that I could use it and I knew that it was there, but I never felt comfortable using it, because I was brought up to believe that you have to, you have to work with people and you have to respect what people do no matter what job they do. Paul Jay:	Which is why you decide mostly to be in New York, not in LA. Gabriel Byrne:	Yeah. I lived in LA for about six or seven years, but that was a personal decision connected with my family. It’s an insider’s club there. I remember one day I was making a film with an extremely well-known actor, and some other actors came to see him, and they were talking, they were comparing which was the best jet. I thought to myself, this is a surreal conversation. Gabriel Byrne:	Yeah, it’s a surreal conversation. Is a ghost stream one or a ghost stream two better, whatever. Paul Jay:	You’re now in the U.S., how are you understanding American politics? Gabriel Byrne:	Britain, I have to say, was a very class-driven society. It still is, and the old school tie and so forth, working class, middle class, though the middle class has been eroded now, but three classes. You are never not aware of that. The way you spoke, the way you dressed, where you lived, all those things. I didn’t find that same class structure when I came to America, but I was aware of … throughout the 80s, I started to study foreign policy as a result of the Falklands experience with Thatcher. I started to really think about Oliver North and Reagan and all those wars in central and South America, what was all that about? Realized that from my education with my friend in London, that you had to look beyond those headlines. Of course, Reagan was a brilliant actor. He was a terrible actor in reality, but he was a brilliant actor in the way that, if you look at footage of him, and the way he was so charismatically manipulative in the tone of his voice and the way he stood and the expressions of his face … I began to understand that leaders, to a great extent, have to be, have to adapt some of the characteristics of a charismatic actor. Paul Jay:	He was better playing president than any film he was ever in. Paul Jay:	Much like Bill Clinton here. I remember thinking to myself, I wonder is this Tony Blair again? How can one man, you know, purport to fix this system? I remained at a distance from American politics, watching it and realizing that what I had grown up with in Ireland was a narrow emotional nationalism. I said, but we were the victims of British colonialism, and America seemed to me, to be a colonial power in the same way. Most European countries in the 19th century, France, Portugal, Spain, Belgium even, they were all colonial powers, and the world was divided like that. If you were weaker, you were vanquished and so forth. I didn’t believe the stuff out of South America because I knew people from South American and I knew none of this was actually true, and yet I’d watch Reagan and be kind of seduced by him. In the same way that I was kind of seduced by Blair and Clinton and Obama, you know, all of them. Paul Jay:	During the Obama years, especially the early years, did you kind of buy into the excitement? Hollywood was particularly, extremely excited. Gabriel Byrne:	I might have bought into it. I mean, people were so, just like with Thatcher, people were so worn out by the Bush years that it seemed like the entire world was going to change, just as Tony Blair had kind of promised that Britain was going to be changed forever by his prime leadership. I remember thinking, could this be the same thing again, so I watched it. Then I saw the most peculiar thing, that he was awarded the Peace Prize before he’d even done anything. I thought the thing he should have done there was handed that back and said, “Listen, I don’t deserve this yet,” but he gave a speech about, you know, I thought, this sounds … this doesn’t sound real to me or true to me. I think so many people were disillusioned by Obama and people, it’s divided. People think he was a great president, but I retained a certain amount of skepticism and cynicism throughout the whole thing. Paul Jay:	Okay. In the next segment of our series of interviews with Gabriel, we’re going to talk about perhaps the thing he’s most passionate about right now, other than his family: the issue of climate change crisis. Which both he and I have been talking about and neither of us get how you can have such an existential threat that is barely on the political agenda and barely gets talked about. But we are going to talk about it, so please join us for that on “Reality Asserts Itself” on the Real News Network.